The Ethics Review Board (ERB) of Médecins Sans Frontières (MSF) had to contend with this question during the 2014 Ebola epidemic. They recently chronicled their experience in the April issue of Public Health Ethics. The GBI Summer School, in the heart of NYC’s Pace University Campus, is a fantastic opportunity! International scholars and professionals from all over the world attended the program, contributing their experiences and engaging with bioethics experts. The City of New York – with the nearby Pace University Campus, Brooklyn Bridge, City Hall, and 9/11 Memorial – provided the perfect setting to discuss the global ethical challenges in technology and medicine. Discussions ranged from law and politics to culture and psychology, encompassing the ethical dilemmas that define the 21st century. I have immensely enjoyed not just the internationally known faculty but also hearing from the learners who come from all over the world representing diverse fields. We’ve long been thinking about health, well-being, illness, sickness, and disease, in relation to risk. That things might not be maintained at their present levels, either individually, among our cared-for, or socially, is not something new, even if we’ve entered a period of intensification, with calls to ‘repeal and replace’ the Affordable Care Act, and the slow, often subtle chipping away at social safety net policies in the United States and throughout the North Atlantic in the spirit of austerity and for the sake of freedom. What might have been primarily personal and interpersonal concerns about health and disease have also expanded to include the environment and the species, as we continue to think through the Anthropocene and its consequences for exposures to environmental dangers – toxins and radiation foremost among them – and the spread of once localized diseases to the global stage, as the recent zika outbreak raised, and Ebola recurrently threatens. The intensification and generalization of risk may very well entail the intensification and generalization of speculation; what are our individual and collective possible futures? And what better way to confront our possible futures than through media that explicitly engages with the future, speculative and science fiction? Is speculation fundamental to life itself? That’s the question that Steve Shaviro seeks to answer in his recent Discognition. Shaviro argues that sentience itself – which we might see operating in computer programs, plants, slime mold, and emergent technologies – is founded on the existence of the ability to speculate, to anticipate and plan. We may not be able to infer how speculation works for a sentient computer program or a slime mold, yet, they depend upon an ability to forecast, to imagine what may come next, so as to act appropriately in advance. Please enjoy the article round-up for the month of May! This post was put together in collaboration with Ann Marie Thornburg. Buddhist medicine (sowa rigpa) in Siberia frames the natural world as overflowing with therapeutic potencies: “There is nothing in the world that isn’t a medicine,” goes a common refrain. An exploration of sowa rigpa practitioners’ committed relations with the plants they make into medicines challenges human-centric notions of efficacy in anthropological discussions of healing. Their work of making things medicinal—or pharmacopoiesis—centers on plants’ vital materialities and requires attention to the entanglements among vegetal and human communities and bodies. Potency is thus not the fixed property of substances in a closed therapeutic encounter but the result of a socially and ecologically distributed practice of guided transformations, a practice that is managed through the attentive labor of multiple actors, human and otherwise. In Siberia, pharmacopoiesis makes explicit the layered relations among postsocialist deindustrialization, Buddhist cosmologies, ailing human bodies, and botanical life. In the study of disasters, the concept of vulnerability has been primarily employed as a cumulative indicator of the unequal distributions of certain populations in proximity to environmental and technological hazards and an individual or group ability to “anticipate, cope with, resist and recover” from disaster (Wisner et al. 2004). This concept has influenced disaster research as a means to question how natural, temporary, and random disasters are and focused analysis on the human-environmental processes that produce disasters and subject some populations more than others to risk and hazards. The Ebola virus is a filovirus that can be passed from person to person through direct contact with blood or other bodily fluids. It is a difficult task to succinctly describe the professional accomplishments of Arthur Caplan, PhD. For the uninitiated, Dr. Caplan is perhaps the most prominent voice in the conversation between bioethicists and the general public, as well as being a prolific writer and academic. He is currently the Drs. William F. and Virginia Connolly Mitty Professor of Bioethics at NYU Langone Medical Center and NYU School of Medicine, having founded the Division of Bioethics there in 2012. Additionally, he co-founded the NYU Sports and Society Program, where he currently serves as Dean, and heads the ethics program for NYU’s Global Institute for Public Health. Prior to joining NYU, he created the Center for Bioethics and Department of Medical Ethics at the University of Pennsylvania Perelman School of Medicine, serving as the Sidney D. Caplan Professor of Bioethics. Dr. Caplan is a Hastings Center fellow, also holding fellowships at The New York Academy of Medicine, the College of Physicians of Philadelphia, the American Association for the Advancement of Science, and the American College of Legal Medicine. He received the lifetime achievement award of the American Society of Bioethics and Humanities in 2016. Dr. Caplan’s experience is not at all limited to the academic realm: he has served on numerous advisory counsels at the national and international level, and is an ethics advisor for organizations tackling issues from synthetic biology to world health to compassionate care. Dr. Caplan has been awarded the McGovern Medal of the American Medical Writers Association, the Franklin Award from the City of Philadelphia, the Patricia Price Browne Prize in Biomedical Ethics, the Public Service Award from the National Science Foundation, and the Rare Impact Award from the National Organization for Rare Disorders; he also holds seven honorary degrees. This week’s Research Ethics Roundup highlights a Nature editorial that encourages researchers to push back against both public and private forms of censorship in research contracts, the National Institute of Health (NIH)’s Comparative Genomics Branch issues new study with implications for both human and dog disease research, the World Health Organization (WHO) speaks with Doctors Without Borders about using an experimental vaccine to target a new Ebola outbreak, and bioethicists’ concern about stem cell researchers’ failure to publish study results including discoveries on side effects. The post Research Ethics Roundup: Nature Argues Against Research Censorship, New Comparative Genetics Study, WHO Considers Deploying Experimental Ebola Vaccine, Majority of Completed Stem Cell Clinical Trials Never Published appeared first on Ampersand. Already, Abraham has begun collecting blood samples from survivors of Ebola, Marburg, and other hemorrhagic fevers. 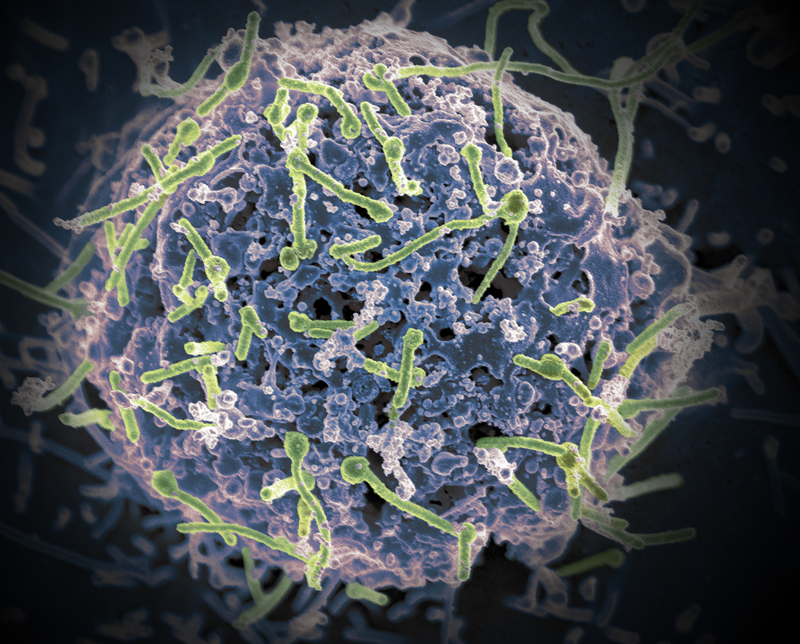 The next step—and it can be a long and tedious one—is to isolate the B immune cells that produce the antibodies responsible for fighting each of the viruses. When he finds one, Abraham will then identify and sequence the specific immunoglobulin genes encoding those antibodies in the appropriate B cell. Having those DNA sequences in hand, Abraham can make large quantities of the antibodies, allowing him to study their ability to neutralize the viruses in lab dishes and infected animals.